This shamrock ring has been hallmarked sterling silver by the Irish Assay Office at Dublin Castle. This delicate shamrock ring features green CZ stone leaves and is further augmented with white CZ stones set in the front half of the ring. 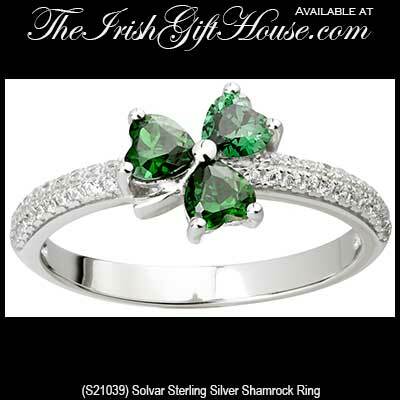 This Irish ring measures 3/16" wide and it is gift boxed with a shamrock history card, complements of The Irish Gift House. 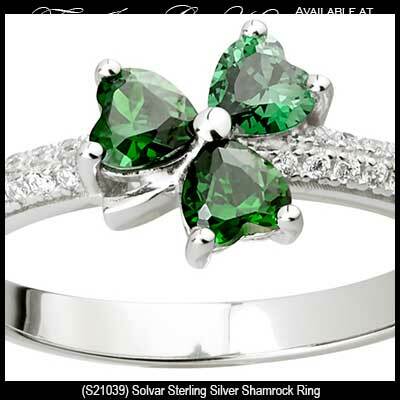 Shamrock pendant features sterling silver construction that is enhanced with green crystal leaves.